Maddie answered an ad I posted. She understood I wanted to make a shoot with people who have visible scars and trusted my judgement from seeing other portraits on the site. When she came in, I saw a woman whose haircolor was as strong as her determination. There is something about Maddie - a poem of a face with affirmatives and exclamations and a scar above the upper lip as punctuation. While my scar is very minimal, like any scar it has had an impact on my life and represents a trial. I was very lucky to be born with only a minor cleft lip, which, after a difficult surgery, left me with only a minor scar that would carry major implications. It wasn't until I understood what it that scar meant; the visual representation of a 'defect' that had needed to be fixed; that I began to grow self-conscious of it. It's difficult, as a young woman, to accept a compliment like 'you're beautiful!' when the truth is the only reason I have my scar is aesthetics. My cleft lip wouldn't have affected my breathing, or my eating, or my speech: only the way I looked, and thus, how people would view me. Knowing this and internalizing this changes the way you view yourself. It takes a long time to learn this. For every dozen actors who are cast as the villain because of their cleft lip, there is only one Hassan in "The Kite Runner" to show that the scar doesn't necessitate evil. For every reiteration of Francis Dolarhyde, there is only one Kondou Otsune, and she is a rarely-talked-about historical figure that has been erased in popular media. "Hairlipped Heroes" aren't in vogue. My father used to tell me 'You're the most beautiful girl in the world' and I would say 'If that's really true, I should enter every beauty pageant' and he'd reply 'well, that's the thing about beauty; not everyone sees it the same way.' I agree. I wanted to do this Facemotions project because it made me uncomfortable. Because it wasn't my idea of beauty, maybe, but my idea of ownership. Of my identity, that I have learned to be proud of, which has been a defining lesson for me throughout my life in critical thinking, empathy, and self-assurance. Because I could be told by medical professionals that I was clinically unattractive, and then scouted for a modeling contract while going to school in Japan. Because Rufus Sewell is always the bad guy, but Khaled Hosseini does not play by those rules. I'm still a little scared by it. But that feels good. It feels good to have done something that matters enough to be scared by it. I had seen Stephanie's work before replying to her ad. It was beautiful: and not in the typified commercial sense, but in the visceral sense. You could see the emotion drawn onto people's face, their personalities bursting forth in multi-coloured shades. In a way, Steaphie's project made everyone look the same, by making everyone look so vastly different. No two people were alike, or 'normal', and there was certainly a cohesive oneness about that. Yet looking at those portraits told me more about who everyone was as an individual. They were respectful, empowering portraits that focused on bringing who people were on the inside out loud and into focus, using their faces as a canvas. Stephanie has the keen insight to do that. I felt very comfortable in sitting for her. Even better, for me, was bringing along a friend and seeing her included in the project, watching her transformation as well. You become very quickly comfortable in wearing your paint. Even after washing up, I was still finding Stephanie's lines on me for hours after- and there was something ironic about being less self-conscious of those big red streaks on my face than a tiny scar! It certainly put it into perspective, which I think is a wonderful thing to take away from Facemotions: new perspective. Stephanie Corne is a French American Artist living in NYC who welcomes any inquiry about portrait making. Maddie -Face Portrait and biography. Skin in All Its Forms- A Facemotions Event In Montreal! 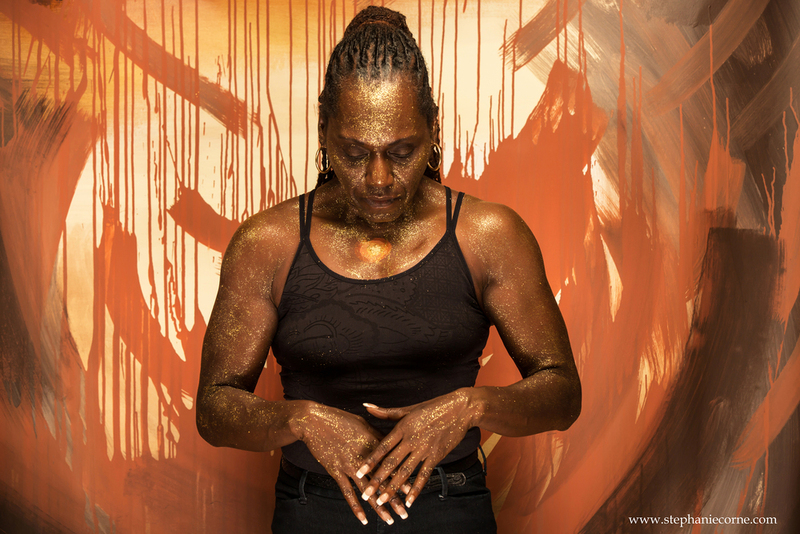 Artist Stephanie Corne does a Facemotion Portrait photo shoot and vitiligo round table at the MAI in Montreal. Facemotions vitiligo portrtait of Telisha by Stephanie Corne. Laura's Facemotions portrait and biography. Beauty, strength, faith and motivation...this is what Facemotions is about for me and why I had to be a part of it. My shoots are about the capture of emotions of someone in a particular setting but the worst thing that can happen to an image is to be just that: an image. There is what is invisible to the eye that I try to convey and there is also a narrative behind a face. I want to let people tell their story themselves. Here is the last Facemotion portrait I have made. It is a portrait of Jamil Miller: a woman for whom I have profound respect. Someone who’s seen it all and is the one smiling the most in the room. Someone who inspires people to aim for their best. I'm Jamil Miller...mom, grandma, personal trainer...woman of amazing faith and strength....I love motivating anyone to get and stay in the best health and shape of their life....no matter what age. I put God first in all that I do. Everything in my life and everything that I am would not be if it we're not for the grace and mercy He bestows upon me ech and every day. I know that my abilities, my motivation towards helping others, the love i have for personal training and keeping my body physically fit all come from my faith in God....knowing that prayer answers all things and changes things as well. I have stepped out on my faith numerous times and although tough and unknown roads were ahead, I still pressed on. I truly love New York and the wonderful mosaic of people that are here. It truly is the city that NEVER sleeps...you can find ANY type of food at any hour of the day or night - and probably have it delivered right to your door. I love the 'options' NY has - you can walk down ONE block and take a yoga class, lift weights or take a spin class....and of course there's always someone you meet that knows somebody that knows somebody that knows that other somebody that you just met yesterday! It offers wonderful Broadway plays to small comedy clubs to scenic biking routes....I will always love NY - I've reached the top of the fish bowl in the big city....so, for me now in the second half of my life, as I continue to change and motivate people towards a healthier lifestyle, I want year around warm weather and suburban life. I've made it here....I can do it - ANYWHERE! I am excited to bring our style of HIT training to the West coast.....it will never be the same… Arizona…here comes Jamil and Naturally Intense!